This is the last cushion of the day before Easter as I’m taking a short break in Cornwall so it’s fitting that it’s a Cornish linen cushion showing Roskilly’s, famous for it’s home-made ice cream, sorbets and fudge as well as its cosy restaurant with log fire in the winter and open air cafe in the summer with live music in the evenings. The farm is on The Lizard, nearest town St Keverne and well worth a visit. 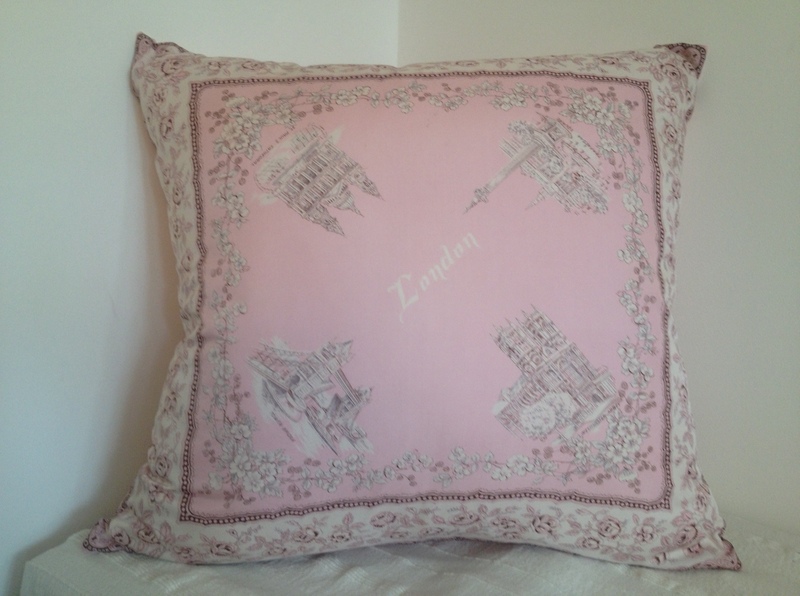 This pretty silk scarf shows London scenes of St Paul’s, Westminster Abbey, Tower Bridge and Trafalgar Square with a flowered border. It is 25″ with a pale pink reverse and pink and white buttons. 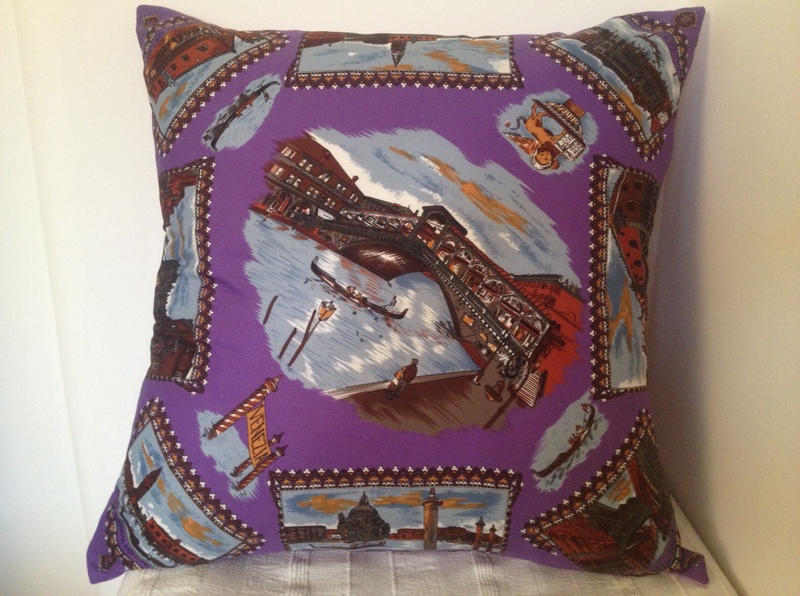 An unusual Venice souvenir scarf in that it shows a nighttime scene of a gondola at the Rialto Bridge surrounded by other scenes of Venice. It is 25″ with a lilac reverse and lilac, grey and ochre buttons. 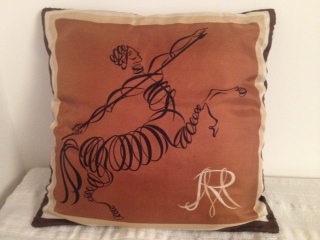 Here is an interesting silk scarf made as a company souvenir for Remy Martin and designed and signed by Genevieve. It is 24″ with a chocolate reverse and zip and dates from the 1970s. 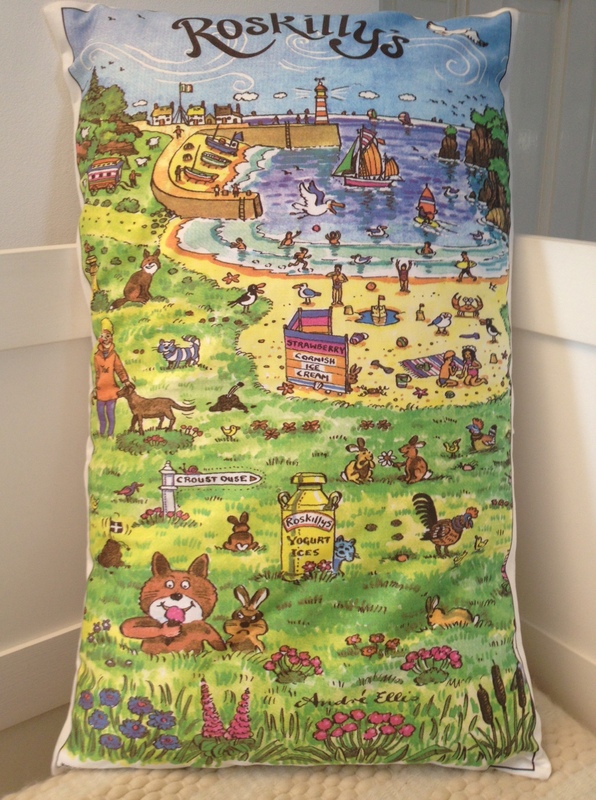 Continuing the theme of trying to cheer everyone up in this cold weather, here is another bright cushion from a warm place! 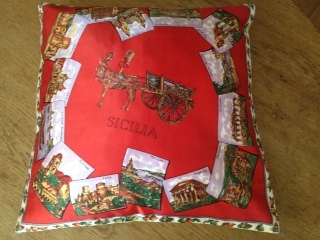 Sicily features a donkey and cart surrounded by scenes of the island with a border of oranges and lemons. It is 26″ with a pale green reverse and orange buttons. 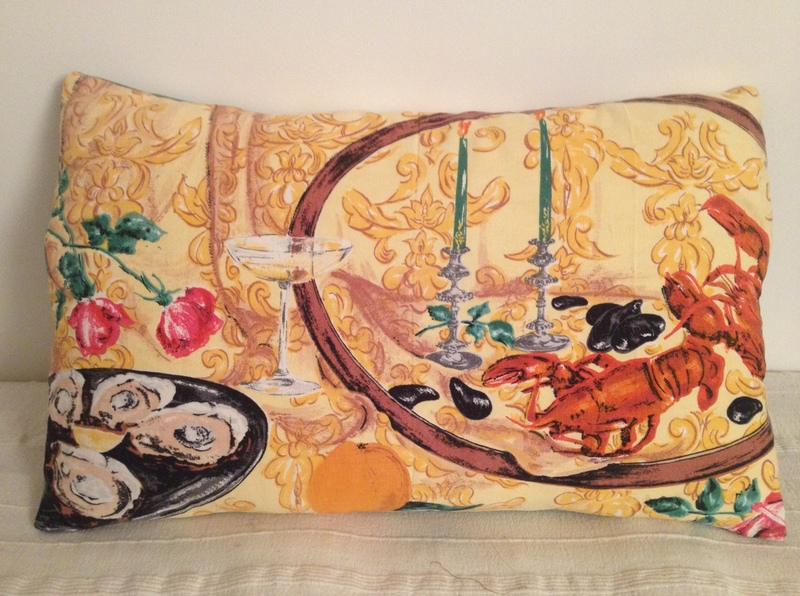 A 1950s linen tea towel cushion, suitable for the kitchen or garden, featuring lobster, oysters and champagne glasses which should cheer us up on another cold day! 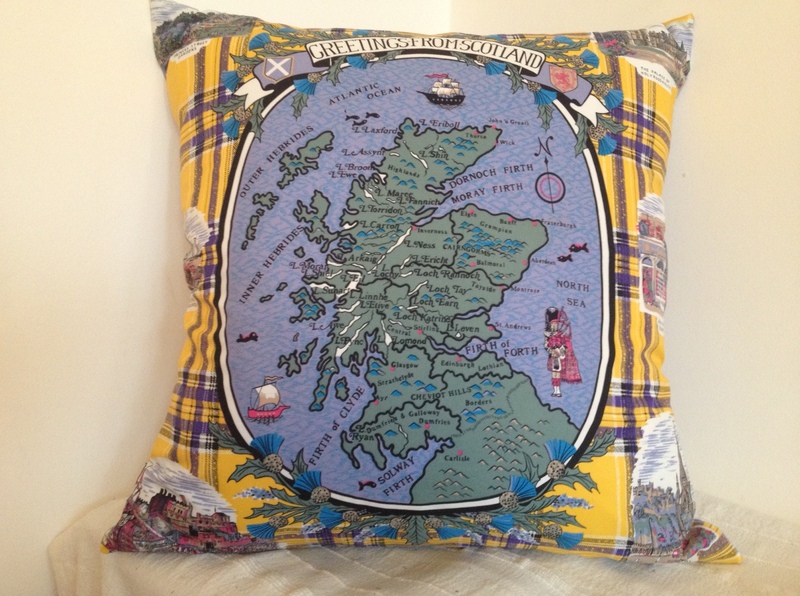 This scarf shows a map of Scotland surrounded by Princes Street Gardens, Forth Road Bridge, Military Tattoo at Edinburgh Castle, Scott Memorial, Greyfriars Bobby and the Palace at Holyrood House against a tartan background. It’s 26″ with a pale blue reverse and purple buttons and dates from the 1990s.